Trouble-shooting eyelash extension aftercare problems. The treatment of eyelash extensions, eyelash lift and eyelash tinting is not harmful if applied by a professional practitioner who cares about the well-being of their client. The products we use are well-known tested brands but they do have chemicals that your body might react to. Before you come to us for your treatment you will have to have an allergy patch test which takes seconds to do and we recommend if you have the time you book in for a free pre treatment consultation. If you do not show signs of discomfort, irritation or swelling on the area tested within a 48-hour period you can go ahead with the full treatment. If after the treatment you have any signs of swelling, irritation and redness along the lash line you must call us immediately for the removal of the eyelash extensions. Do not try to remove the lashes yourself by pulling at them or buying eyelash adhesive remover and applying it yourself. When we remove eyelash extensions we use a barrier cream along the lid line to minimise additional chemical contact that could further irritate the problem. Consult your doctor or your pharmacist in case you are in need a course of antihistamines to help with the allergic reaction. It is important to ensure you maintain eyelash hygiene especially around the eyelid area. A mild cleansing solution e.g. diluted baby shampoo or a non oily make-up remover should be used to clean the area on a regular basis. If you find you are experiencing redness, irritation or flaking around the lid, please make an appointment for consultation. If you have had long periods of eyelash extensions treatments you or your eyelash practitioner might see signs of dry flaky skin and redness along the lash line and could indicate the medical condition of Blepharitis. Blepharitis is an inflammation of the eyelids. It usually affects the edges (margins) of the eyelids. It is not usually serious, but may become an uncomfortable, irritating problem. Removal of the eyelash extensions is necessary and a good eyelash cleanse and regular eyelash shampooing will keep the problem under control. Madarosis is a hair loss condition of the eyelashes called ciliary madarosis, or also known as milphosis. The cause can be associated with obvious cosmetic damage to the eyelid and follicles from an inflammation problem. Although there are systemic causes that result in this problem that would need to have medical examination. A stye or hordeolum is a small, painful lump on the inside or outside of the eyelid. It is actually an abscess filled with pus and is usually caused by a staphylococcus bacteria eye infection. Styes are usually visible on the surface but can appear deeper inside the eyelid. An external stye starts as a small spot next to an eyelash. It turns into a red, painful swelling that usually lasts several days before it bursts and then heals. Most external styes are short-lived and self-limiting. An internal stye (on the underside of the lid) also causes a red, painful swelling, but its location prevents the familiar whitehead from appearing on the eyelid. The internal stye may disappear completely once the infection is past, or it may leave a small fluid-filled cyst or nodule that can persist and may have to be opened and drained. Styes are usually caused by staphylococcal bacteria, which often live right on the skin surface. 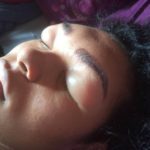 Eyelash extension wearing clients who develop a stye should seek medical advice before requesting removal of the synthetic lashes by their technician. Chemicals will be used for the removal procedure that will irritate the condition.